Welcome to our new trustee Graeme! What was your favourite job ever? With a degree in Physics from Manchester University, I spent the next 9 years teaching science in Stockport. I was then approached by the University of Salford to run their mobile training programme. Having converted a single and double-decker buses into hi-tech mobile training resources, I travelled throughout the UK and Eire delivering IT, robotics, pneumatics and electronics courses. A great privilege and pleasure. With the development of the internet, I found a new outlet for my IT and design skills. I have spent more than 20 years building websites for many educational, commercial and third sector organisations. 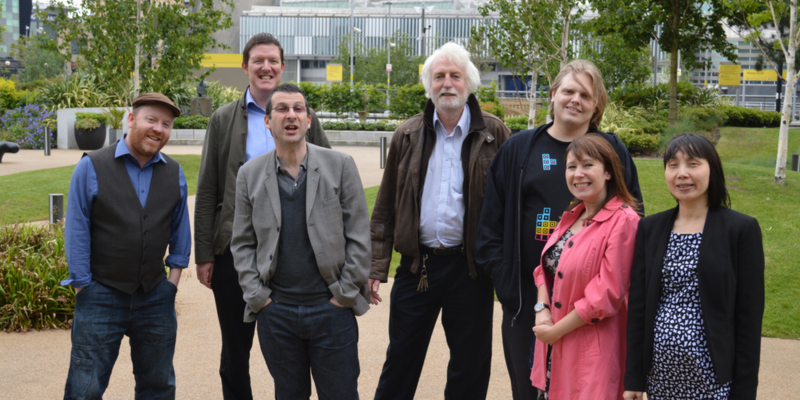 Towards the end of my career I was the webmaster for the University of Salford (photo Salford web team). Since retiring I have been offering those skills freely to various ‘good causes’. I think we should all make use of what we have learned during our careers to benefit other, when we have the time. I support Loose Change Buskers, an extraordinary group of volunteers who play instruments, sing and gratefully collect all of your ‘loose change’ in their buckets every weekend at various places around Greater Manchester. 100% of what is collected goes to Cancer Research UK. In 2015 they won the Flame of Hope from Cancer Research UK and in 2016 were awarded the Queen’s Award for Voluntary Service for their support for Cancer Research UK and community work. As of June 2018 they had collected £445,000. Why did you want to be involved with Arc? To make use of my skills and contacts to benefit the staff and clients of a well established and successful third sector organisation.